Instead of only focusing on the HUMAN rainbow (different ethnicities in our people-coloring)….let’s not forget the four legged critters! They also come in all sizes and shapes. I know I color lots of my dogs and cats to look like my furbabies, but I think I, too, need to branch out! By the way I didn’t mention it in the video but this was all done on Classic Cream Neenah…… Watch the video below or click HERE to see it in HD on YouTube. So much fun coloring all these critters! So cute. You are getting younger everyone else is just getting older. It is a frame of mind. I like ALL those animals on the card! So fun. It’s and have friends that also have pets and our dogs are at each other’s houses. I mean, bring your craft stuff and bring your dog, right? BUT . . . someone has got to make a Newfoundland dog stamp!!! 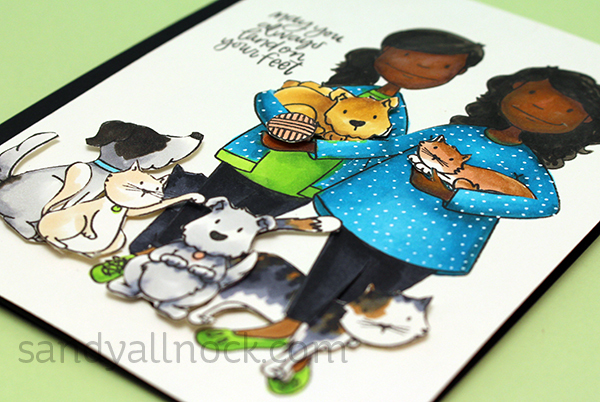 Love the adorable card with the kitties and puppies. Love your idea with the kitty wrapped between ankles. ha ha. Works for either dogs or cats. Looking forward to this set coming out to add to the ladies sets. Great photos of Vienna (happy birthday to her too) and G, BUT where is the kitty?? Kitties need some online time too, I miss seeing Punch. Is he okay? 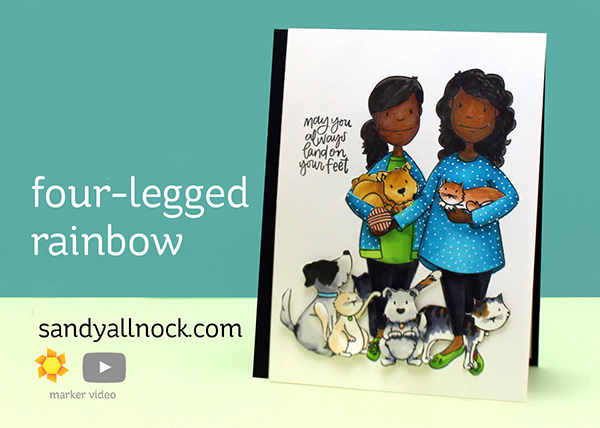 Your card is even more adorable after watching the video ! Living with 3 cats and 2 dogs, you can imagine I love it and find it inspiring. I always find your video very instructive, thank you for all the work behind each one of them. Love the card Sandy, so sweet! Hello to Giallo, such a cutie. And a big Happy Birthday to Vienna. February 14 is my Jackson’s Birthday also. He will be 13. He is 1/2 German shepherd and 1/2 husky. All husky in personality – lol, always has to have the last word. Thanks for all your great videos. OMG . . . could this be any cuter. The coloring is fabulous, as always. Love you art! Or your art . . .
Great critterjob Sandy! I love the card with al the pets, it’s a tribute to vets and there assistants. Thanks Sandy for this gorgeous card and the way you solved so quickly the video problem. Oh, fabulous. Love how you added all the animals. This card is so darling! You need to frame it for you vet’s office. Happy early birthday to Vienna, & hello to Mr. Giallo. Stormy says, “Woof,” ’cause she’s excited to share her birthday month with Vienna. Sky, who everyone knows is the Queen of the Universe, extends an open invitation to all three of you to come for a Royal Visit to Play with Her Majesty. Great! Just ordered mine, now to wait for the mail! I live in a college town. Talk about getting younger and younger! I’m more upset when my doctors are half my age, they were always old men. At least now we can find women. I love the card. Putting the slits around their legs and weaving the pets was a wonderful idea. Thank you. I couldn’t wait to see what these new leading ladies were going to be! Love them! Your card is adorable! Who makes the stamps? Your art work is always so inspiring … I just love your heart for animals. Makes up a tiny bit for all of those who discard them as trash.